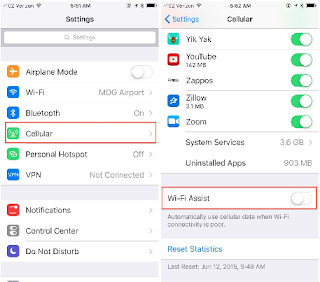 3Gstore.com Blog: Should I Disable the WiFi Assist Feature on My iPhone? 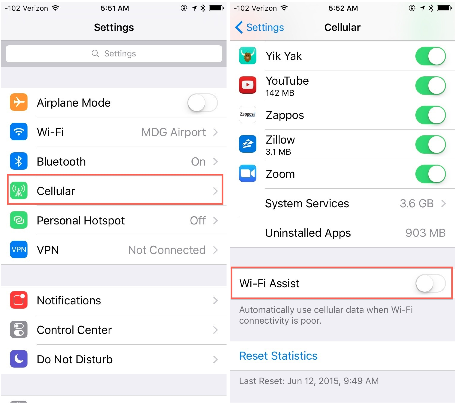 Should I Disable the WiFi Assist Feature on My iPhone? If you’ve recently upgraded your iPhone to iOS 9, you may want to read on! More than likely, you haven’t noticed that something called “WiFi Assist” gets enabled by default. Basically speaking, WiFi Assist is a smart feature that is able to detect a weak WiFi signal and then automatically switch over to the cellular network. For users looking for a way to maintain a more consistent Internet connection when traveling in and out of WiFi hotspots, this is a great feature. Not so much however if you’re on a limited data plan. In that case, it would be wise for you to disable this! No need to restart the phone since the change will take effect immediately. The iPhone will now work as it had prior to the iOS 9 update - meaning the cellular data will ONLY come on when the WiFi signal is completely lost. If you ever want to change the setting back, simply repeat the steps and toggle WiFi Assist back ON.